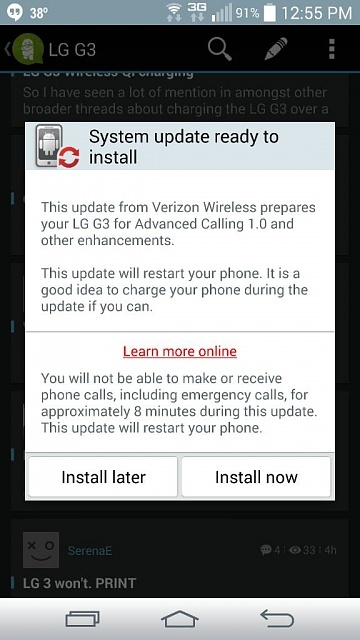 The link below now shows the Verizon LG G3 as being compatible with VoLTE. Did anybody get an update to enable this? Hmm, I am now curious myself since I am on Verizon. Must be in the next update. Odd. Can't turn that on for it in my account. Maybe an update enabling it shortly? EDIT: I just went back in and the option was in the account. Not sure how to enable it on the phone yet. I just received an update notification for it. Will do the update soon. Looks like advanced calling 1.0. Has anyone installed yet? Any thoughts? If that means VoLTE then I guess that's it. Too bad they couldn't have got us to the big L. But I won't expect that until maybe March the way big red works. In Settings, there is now a whole new item devoted to Advanced Calling. It has an item to enable it which I think turns it on with Verizon and an item to enable it on the phone. I'm rooted running cm 12, how do I block this update? I have a Verizon Galaxy S3 that I rooted with towelroot and not it won't update, did I do something wrong? can a Verizon S5 use T-Mobile prepaid sim card and get T-Mobile 3g speeds? I just downloaded the Verizon 4.4.4 update on my Note 3 and now I can't minimize opened apps, why?